Afghans are predominantly Muslim, so Christmas is not celebrated in Afghanistan. As a little girl, I spent nights pondering how Santa Clause knew my family is Muslim and therefore didn't deliver presents to me but my American friends, children of diplomats in Kabul, did get a delivery of fancy toys. I finally decided that they must have CHRISTIAN written on their roof so when Santa flew over their house, he knew to drop down their chimney. Perhaps Mr. Trump would like all MUSLIM Americans to identify their homes with red letters, so his Gestapo can drop down their chimney. No matter what religion you practice, I wanted to share this recipe, so you can surprise your family and friends with this unexpected sweet gift—Afghan Almond Brittle—instead of the predictable box of chocolate. 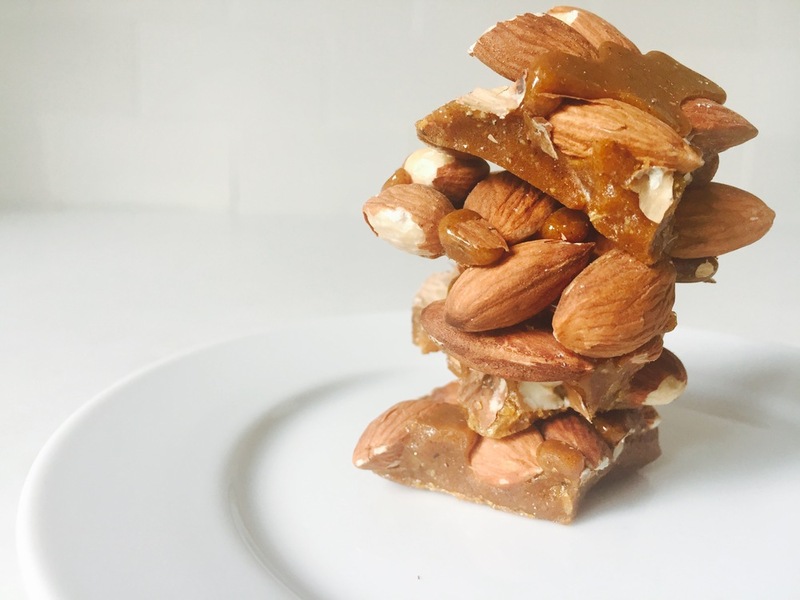 This almond brittle features the subtle yet distinct flavor of cardamom along with several options to play with the seasonings. The biggest challenge with this recipe is to get it into the gift bag or jar before you’ve gobbled it all up. The crunchy sweet Afghan combo is highly addictive. Cover a baking sheet with parchment paper. Spread the almonds in a single layer on the baking sheet, grouping them all together with no spaces between the nuts. Heat the sugar in a heavy-bottom saucepan over medium heat, stirring regularly. The sugar will eventually turn to liquid. Continue to cook, stirring all the while, until the sugar is golden brown. Add the cardamom and cook a little longer until it reaches a deep amber color and smooth texture. The whole process of caramelizing the sugar will take about 15 to 20 minutes. Drizzle the sugar in a thin stream evenly over the top of the almonds, covering them all. Cool completely. Break up the almonds with your fingers into two-bite pieces. Store in a jar with a tight lid or package for gifts. Sprinkle 3/4 teaspoon fleur de sel over the top of the caramelized sugar after you’ve poured it on the almonds. The salt will be delicious with or without the cardamom. For more holiday gift giving ideas, Afghan and otherwise, check out the recipes here. I grew up with cardamom as a staple in Jeja's, my mom, pantry. She uses green cardamom to add an aroma and special flavor to in tea and desserts. On occasion, she uses the pungent black cardamom in savory dishes. I keep a small jar of ground cardamom in my fridge for the infrequent occasion when I want to Afghanify a non-Afghan food such as vanilla ice cream, coffee and on occasion oatmeal. Cardamom is native to India, Bangladesh, Bhutan, Nepal and Pakistan. This spice is commonly used in Indian, Central Asian and Middle Eastern cuisine. It has also made its way into Ayurvedic medicine as a treatment for mouth ulcers, digestive problems, and even depression. Some of the health benefits of this peppery, citrusy spice are now making their way into modern studies. It’s well worth adding cardamom to your food for the flavor alone, but these health benefits are also something to consider whenever you break out the spices. Digestion – Cardamom is related to ginger and can be used in much the same way to counteract digestive problems. Use it to combat nausea, acidity, bloating, gas, heartburn, loss of appetite, constipation, and much more. Detoxify – This spice helps the body eliminate waste through the kidneys. Halitosis – In India they chew cardamom after meals or whenever they need to freshen their breath. Diuretic – Part of the reason cardamom is such a good detoxifier is thanks to the diuretic properties. It helps clean out the urinary tract, bladder, and kidneys, removing waste, salt, excess water, toxins, and combating infections too. Depression – The science behind the antidepressant qualities of cardamom hasn’t been studied yet, but Ayurvedic medicine swears by the tea as a means to fight depression. Oral Health – Apart from helping with bad breath, cardamom is used for mouth ulcers and infections of the mouth and throat. Cold and Flu – This pungent spice may help prevent and relieve cold and flu symptoms. It’s also used for bronchitis and coughs. Cancer – Animal studies are showing promise that cardamom protects against, inhibits growth, and even kills some cancers. Blood Pressure – As a diuretic and fiber rich spice, cardamom significantly lowers blood pressure. Blood Clots – Cardamom prevents dangerous blood clots by preventing platelet aggregation and the sticking to the artery walls. Antioxidant – Many of the vitamins, phytonutrients, and essential oils in cardamom act as antioxidants, cleaning up free radicals and resisting cellular aging. Pathogens – The volatile essential oils in cardamom inhibit the growth of viruses, bacteria, fungus, and mold. Anti-inflammatory – Like ginger and turmeric, its relatives, cardamom has some anti-inflammatory properties that limit pain and swelling, especially in mucus membranes, the mouth, and throat. Hiccups – Cardamom is an anti-spasmodic that can help get rid of hiccups. This also applies to other involuntary muscle spasms, like stomach and intestinal cramps. Aphrodisiac – Traditional medicine lists cardamom as a powerful aphrodisiac that can help with erectile dysfunction and impotence.